Enhance the quality of your dining experience with this simple and elegant dish. 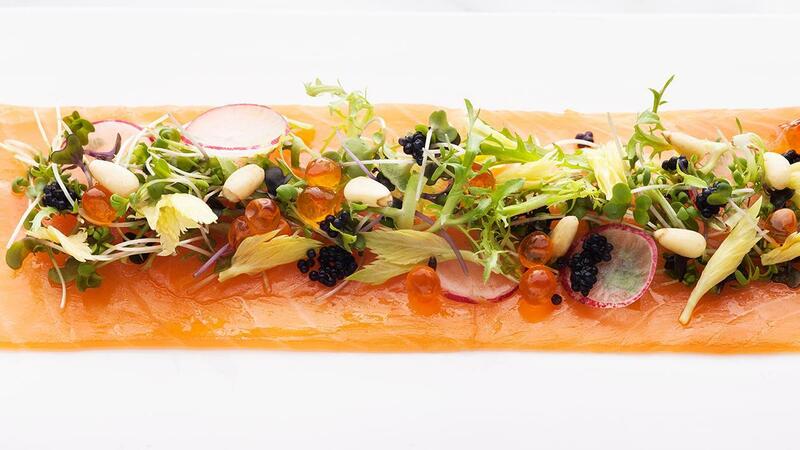 The mild flavours of the smoked salmon carpaccio, elevated by a special yuzu mustard glaze, make this dish perfect for a gourmet appetiser. Add olive oil, soy sauce, yuzu juice, Honey Mustard Dressing and minced garlic in mixing bowl, whisk well. Horizontally Slice smoked salmon across. Wash and spin dry frisee and mizuna salad. Lay salmon slice flat on plate. Brush a layer of yuzu mustard dressing over salmon. Garnish with salad, pine nuts, radish slice and salmon roe.